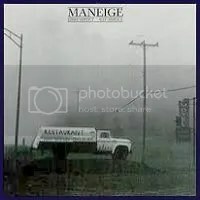 A later album from Maneige, one of the best-known Canadian prog bands. By this point they had almost entirely moved away from the symphonic sound of their earlier classic albums and are playing a kind of light fusion style, somewhat similar to Camel or some of the Canterbury bands. Unlike their previous work, the emphasis here is on shorter, less proggy compositions with more melody and short solos. Fortunately, as with all good fusion, it never becomes merely a showcase for how well these guys can play their instruments. There’s also some messing around with latin, reggae and funk influences that sometimes work and sometimes don’t. The album really gets going with the final four songs, which are among the best they’ve done (and are also the longest songs on this album). Lots of xylophone and flute to be found. Not necessarily as essential as their earlier albums, but a nice album anyway. One of the examples of a successful transition from prog to jazz rock.